Well, look whose back: the Lane County forestry agent. But this one is a new, improved version of the former occupant. Things are looking up: a thinly veiled, pusillanimous effort at some sort of transition into log prices. We’re glad you ask. The past couple years we’ve seen a substantial volatility in the log market. Why, you ask? Our guess is regional mills listen to the economists (1st mistake), drive-up prices in anticipation of a more robust building season (2nd mistake) only to be left with too much lumber manufactured from logs they paid too much money (3rd mistake). The ramifications for woodland owners is to see that seasonal spike coming earlier in the year, followed by declining values with the progression of summer. And every year you hear about fire season and prices might rise due to logging restrictions. Occasionally, this can result in a leveling-off of values, or possibly a very slight increase. But in all the years we’ve been logging and working for extension, a person can count “shut-downs” on one hand. 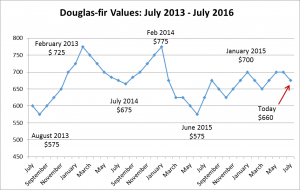 So at the time of this article (late July) Doug-fir values in Lane County are running in the $650-$675/ MBF range. These are long-log prices. Over the past few years, we’ve seen premium values for the “long log” go from 32 feet to 36 feet in a number of mills: longer logs, more taper – less scale, more lumber. Timber stands with a higher form class aren’t necessarily affected by the length requirements, but 4 additional feet in a lower form class can make a noticeable difference in gross scale. Short logs will run at least $100/MBF. The Willamette Valley lost their only cedar mill when Mary’s River in Corvallis closed their doors last year. The reason was lack of material. Anyone selling cedar (incense or redcedar) will have to go to Roseburg, north to Washington, or a sort yard here closer to home. Redcedar is pretty strong at the current time with values for a 36’ log (there’s that 36 again) pushing $1200. Anything shorter and you start losing money for each 2’ increment. Avoid short logs when possible. Incense values will likely be better if you go south. 12”+ incense in Douglas County mills is running comparable to Df values and the 5’ – 11’ log is in the mid $500 range. Good news for Doug-fir and both cedar species is, at current values, buyers are writing purchase orders. If you have incense in the area, slightly lower values will far-and-away trump the added trucking to Douglas County. Hardwoods have been relatively steady of recent months. A visit to the hardwood mill here in Eugene and you see some sparse inventories. Maple is running around $400/MBF; not great, but better than firewood. Camp run alder is well- over $500/MBF and the 8”-9” sort is right at $500. Remember, in this hot weather, alder has got to get-off-the-stump and to the mill PDQ to avoid stain and a significant drop in values. Last year, chips actually made a bit of a comeback with values getting over $30/ton. That was last year. Today, there is an excess of chips, both conifer and hardwood. Local buyers are paying in the mid 20s for conifer chips and the upper 20s for hardwoods. If you travel to the north end of the valley, values go up $5/ton or so, but there is no way you can pay for the trucking. FYI: hybrid poplar chips are a no-go. The plant that utilized them (Newberg) has called it a day and poplar is not popular with any buyers in the area. Export values are basically on-par with domestic prices, but remember longer length and somewhat larger diameter requirements, although log quality compared to years past has declined significantly. Buyers aren’t exactly beating-down your door, so at the current time, domestic is winning the day. Accordingly, when looking for a buyer, there’s a good chance the closest mill will be the best one due to cheaper trucking. So there you go. Prognostications? Values are pretty good at the current time, but I don’t think I’d hold-out for more. And before we forget. Occasionally, folks request valley pine prices. Ponderosa pine is basically a bottom-trawler. You have to go to Roseburg to sell it for veneer cores/backs at a little over $300. Slightly better values can be found in the Medford area. If you do your own logging, you might make a few bucks. Hire a logger and all you’re doing is giving them a job while you liquidate your trees. Questions? Call your local agent: they’ll be glad to help. ~ by grandl on August 15, 2016 .